It's finally here; after a long wait, a full redesign, and a wealth of new and improved features and amenities, the 2017 Honda Ridgeline pickup has made its way to your local Honda showroom. If you are in Venice or the surrounding areas, come to Venice Honda to explore this fabulous new mid-size pickup truck. You might not have thought that trucks were Honda's game, but once you see the new Ridgeline, you will certainly have a change of heart. With many all-new features and a completely redesigned look, the 2017 Ridgeline has been highly anticipated by drivers all over Sarasota, Bradenton, Venice, North Port, and Port Charlotte. But the wait is over! Come and see the 2017 Honda Ridgeline today at Venice Honda and explore this amazing truck in person. Our knowledgeable sales staff is standing by at our Venice Honda dealership, so come and take a test drive in this all-new truck and see how its amazing features will change the way you work every day. If you have been on the lookout for a mid-size pickup truck that can easily fit into your garage as well as any parking space but still have the heft and capability to tow and haul heavy cargo, then you are in luck. The Honda Ridgeline is now available - and it's a game-changer in all the best ways. A smart alternative to a full-size truck, the 2017 Ridgeline is perfect for drivers who are looking for pickup truck capabilities and SUV sensibilities. The extremely well-composed and user-friendly 2017 Ridgeline offers efficient performance and a cleverly designed truck bed as well as a spacious cabin that can fit large items like bicycles or flat-screen TVs with ease. 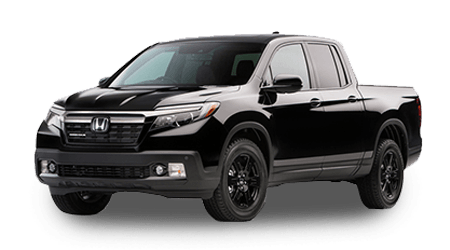 If you have been looking for the right truck to tackle everyday driving, towing, and hauling as well as the perfect amount of off-road prowess, you will love meeting the Honda Ridgeline at Venice Honda. After its two-year hiatus from the production line, the 2017 Ridgeline hits the ground running with a brand new shape that is more pickup truck than the previous models, with a wide front grille, square3d-off roofline and bedwalls, and boxy rear fenders. The interior of the new Ridgeline is based off the new Honda Pilot SUV and features the same shield-shaped central stack with large center touchscreen display. The 2017 Ridgeline features a shift lever instead of the push-button gearbox controls found on the Pilot. Built on a unibody platform like the Honda Pilot, the Ridgeline also features an independent suspension system that delivers a smooth, comfortable ride and some of the best handling of any other truck in the segment. Standard 18" wheels and tires keep the Ridgeline planted firmly on the ground and offer a competent ride that's perfect for every day and special driving situations alike. The mid-size Honda Ridgeline might not be the heaviest hauler or the toughest tower, but when it comes to ride and handling, it shines brighter than its competition. Under the hood of the 2017 Honda Ridgeline you will find the same 3.5-liter V6 engine that generates 280 horsepower and 262 pound-feet of torque. The 2017 Ridgeline weighs just 4,200 to 4,400 pounds depending on the trim you select, making the power-to-weight ratio is much better than it was in previous models, which means that you get more out of the engine's 280 horses for capable performance every day. The engine pairs up with a competent six-speed automatic transmission that will send power to either the front wheels or all four wheels via an AWD system. Fuel economy numbers for the 2017 Honda Ridgeline are impressive as well; with FWD you can expect EPA-estimated fuel economy up to 19 miles per gallon city and 26 mile per gallon highway (22 combined) and with the AWD system you will earn up to 18 miles per gallon city and 25 miles per gallon highway (21 combined). The maximum towing capacity for the 2017 Ridgeline is 5,000 pounds (with AWD; FWD models are rated for 3,500 pounds of towing capacity) and the maximum payload rating is 1,584 pounds; so it's strong enough to tow a 22-foot boat or haul 40 large bags of mulch without feeling like it's being weighed down. When laden with a full truck bed or trailer, the 2017 Honda Ridgeline offers up smooth and unstrained power that will help you get even your toughest everyday tasks done with ease. AWD-equipped Ridgeline models feature a traction management system that utilizes electronic controls to remain stable while towing and hauling by shifting power from the front to the rear wheels and back and forth between the rear wheels. The amazing Honda Ridgeline is available only as a four-door crew cab truck, because it has both passengers and cargo in mind. The cabin offers ample space for all seating positions and the rear seats can even be reconfigured (thanks to a flat load floor and flip-up seat cushions) to allow you to tote cargo inside the Ridgeline when your truck bed is full or when you need to haul sensitive items like TVs or bicycles in safety. There is a deep center console between the driver and front passenger seats and head- and leg-room enough for even tall passengers, even in the rear seats. The truck bed is 50" wide and 63" long with the tailgate closed. Speaking of the tailgate, the 2017 Ridgeline's opens two ways - vertically like a standard tailgate and horizontally like a door - that allows for clever cargo loading. In the bed of the 2017 Ridgeline, you will find an industry first: an available in-bed audio system (standard on RTL-E and Black Edition trims). This amazing sound system can play music from any source and be controlled remotely via a Bluetooth-enabled device like a smart phone or tablet. The truck bed also features a lockable storage bin that doubles as a built-in cooler with a handy drain plug to evacuate water when your party is finished rocking. Some available accessories for the 2017 Ridgeline include a wide selection of roof racks and an in-bed tent for overnight outdoor adventures. If you are looking for a capable, reliable, and hard-working truck that offers a little something different, then you need to come check out the 2017 Honda Ridgeline at Venice Honda. Our Venice Honda dealership has been serving shoppers from Sarasota, Bradenton, Venice, North Port, and Port Charlotte for many years, bringing drivers together with some of the best cars and SUVs on the market; and now, it's time to add one of the best and most-anticipated trucks to our lineup. Come and see the Ridgeline today and take it for a spin. You might find it hard to leave this impressive truck at the dealership when you are done. Our dealership is located at 985 US HWY 41 in Venice, FL; come and see us today! * 19 city/26 highway/22 combined mpg rating for 2WD models. 18 city/25 highway/21 combined mpg rating for AWD models. Based on 2017 EPA mileage ratings. Use for comparison purposes only. Your mileage will vary depending on how you drive and maintain your vehicle, driving conditions and other factors.